Quick and easy guide on how to connect your Reply account to third-party ESP like Sendgrid, Mailgun etc. when you use mass email systems such as Sendgrid or Mailgun. when you use email aliases in Reply. Connect your email account to Sendgrid. In your Reply account, navigate to the Email Accounts tab of the Settings page. Click Add new email account. In the Setup email account for sending dialog window select Other provider and click Continue. 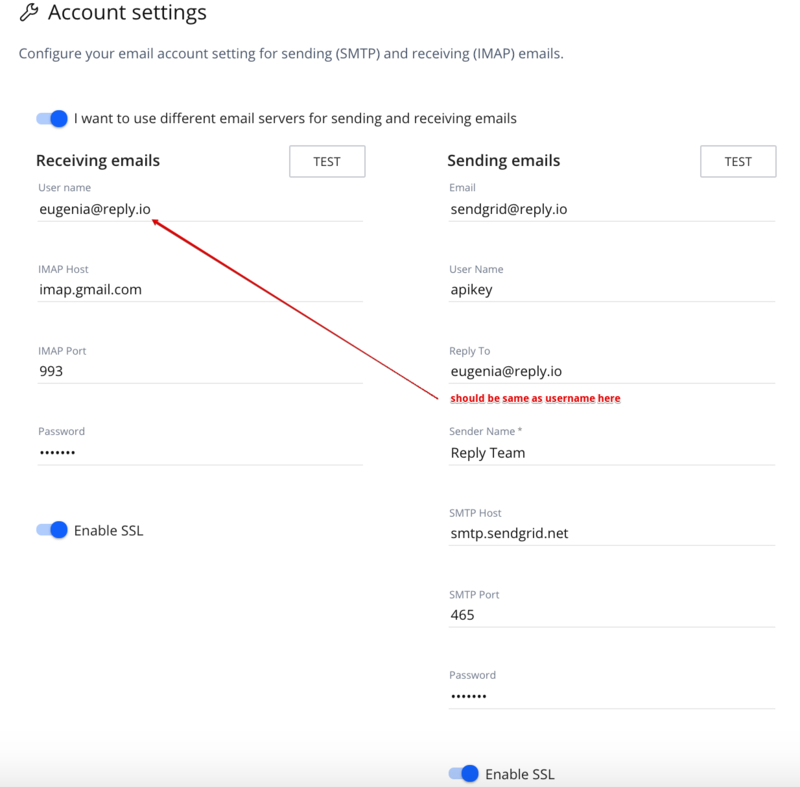 In Account Settings, enable the I want to use different email servers for sending and receiving emails option. In the User name field, enter the email address you want to use to receive replies to. In the IMAP Host field, enter the address of the IMAP server (imap.gmail.com for Gmail accounts). In the IMAP Port field, enter the port of the IMAP server (993 for Gmail accounts). Enable the Enable SSL option (for Gmail accounts). Check the Replies should go to a different email address check box. In the Email field, enter the email you have connected to Sendgrid. Set the User Name to 'apikey' as a standard user name, or set your own. In the Reply To field, enter the same email you use in the the IMAP User name field. Using this field, Reply knows the email address to receive and detect replies. In the Sender Name field, enter your name (example on the screenshot below, Reply Team). In the SMTP Host field, enter smtp.sendgrid.net. In the Password field, enter the Sendgrid password from your email account connected to Sendgrid. Enable the Enable SSL option with the 465 port, and leave disabled if port is 25.